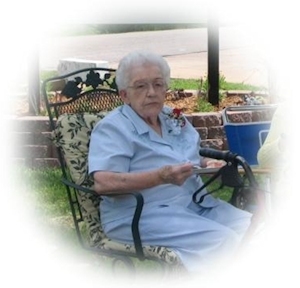 Obituary – Waren, Doris Irene (Robberson) « Perry High School Alumni Association, Inc.
Doris Irene Waren, 96, of Perry, Oklahoma, was the daughter of Walker and Hattie Stout Robberson. She was born on May 2, 1916 in rural Billings, Oklahoma and died Tuesday, May 29, 2012 in Stillwater, Oklahoma. She is a 1933 graduate of Perry High School and attended Oklahoma AM College at Stillwater, Oklahoma. Doris married her sweetheart Ray T. Waren on April 12, 1941, in Perry, Oklahoma. Ray preceded her in death on May 5, 1977. She was a charter member of the Perry Business and Professional Women later known as the Perry Business Women a lifetime member of the Cherokee Strip Historical Society of which she was a past member of the board of directors former member of the Perry Study Club past officer of the Parent Teacher Association now known as Perry Parent Teachers past officer of the Perry Band Boosters was a sponsor of the Perry Teen Town from 1943 – 1944 and was a member of the Order of Eastern Star, Perry Chapter 94, for over 50 years. Doris loved her family and friends and enjoyed watching sports of all kinds. She was a member of the First Christian Church of Perry for more than 55 years. Her celebration of life will be 10:00 a.m., Friday, June 1, 2012 at the First Christian Church, Perry, Oklahoma. Rev. Martin Foster will officiate. Interment will be at Grace Hill Cemetery. Services are under the direction of BrownDugger Funeral Home. Family will receive friends from 6:00 p.m. to 8:00 p.m., Thursday, May 31, 2012 at BrownDugger Funeral Home. Memorials may be made to First Christian Church or Judith Karman Hospice in care of BrownDugger Funeral Home, 1010 N. 7th Street, Perry, Oklahoma 73077. Doris is survived by two sons, Charles Waren and his wife, Pam of Stillwater, Oklahoma, Dean Waren and his wife, Susan of Perry, Oklahoma one daughter, Ann Waren and her husband, Harl Hentges of Stillwater, Oklahoma grandchildren, Traci Hazel and her husband, Mike of Tulsa, Oklahoma, Tiffany McClendon and her husband, Allen of Drumright, Oklahoma, Brittany Waren and her fiance, Scott McKinley of Stillwater, Oklahoma, Gavin Hentges and his wife Jenny of Stillwater, Oklahoma, Amber Coker and her husband, Brance of Tulsa, Oklahoma, Rocky Waren and his wife Carly of Perry, Oklahoma, Ray Waren and his wife LeEllen of Perry, Oklahoma eleven great grandchildren. She was preceded in death by her husband Ray T. Waren, her parents, Walker and Hattie Robberson granddaughter in law, Mindy Waren.